This is one you can always carry with you, without even trying. 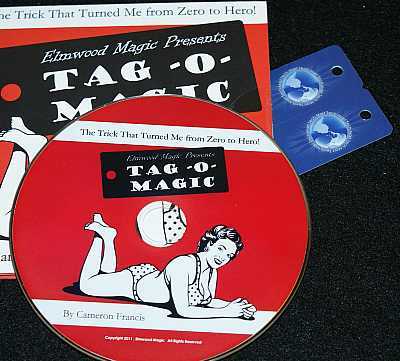 (Well, okay, you do have to try a little...) But once you put the Tag-O-Magic tag on your keychain, you will be ready to meet those calls of "do a trick" when you are in the check out line at the grocery store or some other place you don't have your trusty sponge balls, coins and cards. You show a small tag on your keychain -- the kind that retailers scan to give you loyalty points, etc -- and then you proceed to tear it off the metal ring. The spectators can see the hole in the tag is clearly broken open. But you wave the tag a few times, and the hole magically repairs itself. Very visual magic, but then to finish, you magically penetrate the tag back onto the key ring and hand it all to the spectator to examine. When she says do that again, you can follow up with a different trick, using the specially printed back of the tag. The back of the tag contains a few handy psychological and number forces, and a card revelation. NOTE: the DVD shows how to use a website printed on the back of the tag to do a neat online mentalism effect. As of Dec 2015, I find this website no longer operates. So you cannot perform that effect as taught. But you can do the same mentalism reveals in person using the methods described to force the choices. Even without this website method, Tag O Magic gives tons of great value. Brand new and unused, with DVD instructions.